A rare postcard image sent by Howard Webb: "Postcard by Wakefield of Brentford and Chiswick. The lady at the back in the middle has been added later by the photographer. I don't know who the family are but I imagine it wouldn't be too difficult to identify them if you have access to trade or post office directories." It was delivered by hand. As this matches the initials on the postcard it is likely he is our man. The Bailey's home had six rooms, sufficient for the three adults recorded in 1911. Henrietta completed information about the length of her marriage - 53 years - and children -15 of whom 12 survived; as she was a widow this was not required, but it helps explain the number of individuals shown in the family portrait. Her husband's death was registered in Brentford in the first quarter of 1909, within weeks of the card being sent. Ancestry has several references to the family: John senior had a son, also named John Hinton Bailey, born around 1864, who married Marion Summers at St Paul's Old Brentford in 1884. The son was living at Boston Park Road and was a clerk; his father's occupation: Coastguard. One of the witnesses was Kate Gainsford, a niece of Joseph B Lewis, Brentford Local Board member. Mary Hinton Bailey was married at the same church, 21st July 1898, to John Henry Allan, clerk. Mary was of Meslip? Villa, Whitestile Road and her father a Retired Coastguard. Louisa Marion Hinton-Bailey married in the third quarter of 1901 in Brentford Registration District. Alfred William Hinton Bailey, a commercial traveller age 45, married Dorothy Alice Welch, 27, at Twickenham parish church 30 September 1919; Dorothy was of 46 Adelaide Road, Alfred of 26 Yor(k/ter?) Street, presumably in Twickenham. 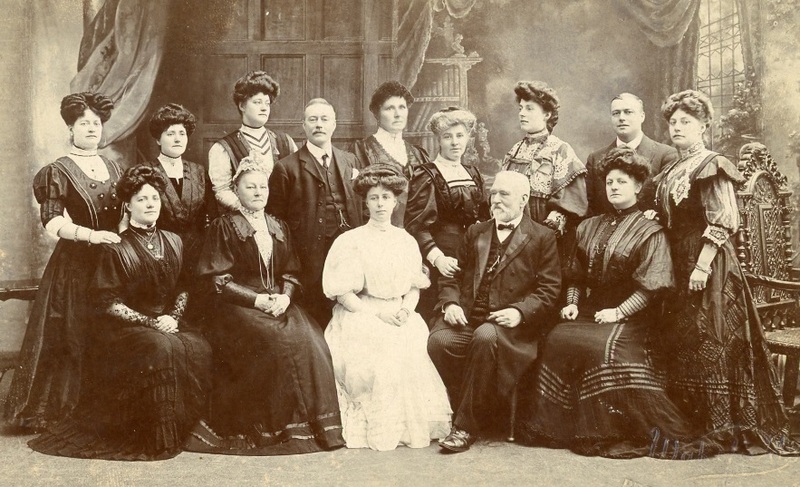 Presumably most of the above are included in the photograph which shows parents John and Henrietta with ten adult women and two adult men. All are dressed in dark clothing apart from one woman, seated between her parents, who is dressed in white. Perhaps she had just married the person behind her? Unfortunately it is difficult to make out whether she is wearing a wedding ring. The lady Howard spotted who was 'cut and pasted' into the centre of the back row may be a deceased daughter or one that could not get to the photo session. The matriarch, Henrietta Hinton Bailey, stayed in Brentford and her death was registered in the first three months of 1921 at the age of 81. The card was addressed to George Challis who was a local councillor. He was living at 24 Windmill Road, Brentford in 1907 (electoral register) and was at the same address in 1911. A James Challis, possibly related, was living at Adelaide Road in 1907.